Evan Hawkins’s art plays with conflicting ideas in the heady historical argument about decline versus ascent of human civilization. Two dozen or so of his superbly rendered drawings and lithographs are currently on display in the Nichols School gallery. They freely mix imagery of the Mayan and modern worlds, and Native American Indian, with its legacy notion of respect for the natural environment, and urban industrial, with its legacy notion of exploit the environment, leave it in tatters. The imagery is largely of ruins, ancient and modern. The amalgam is on one level comic, on another level not so comical at all. The funny versus not funny quality is another level of amalgam. The civilization in decline trope goes back at least to the ancient Greek poet Hesiod, a contemporary of Homer, who described how originally the world was golden, but then rapidly went downhill, to silver, then bronze, and finally iron, which rusts, decays, decomposes, which is of course our world. The world as rust belt. The decline idea wasn’t definitively refuted until the 19th century, by Darwin. Though lots of mostly Republicans reject Darwin. And lots of hard evidence that we’re destroying our own nest maybe refutes Darwin. Ambivalence is a core aspect of the argument and also of Hawkins’ works. Modern world references are often specifically to Buffalo and environs, poster locale for urban decline for the last 60 years or so, but now apparently on the rise again. Though the Buffalo references are more about age and decrepitude than renewal. A drawing basically of the Soldiers and Sailors Monument at Lafayette Square calls it the Tomb of Soldiers and Sailors (pictured) and shows it crumbling at the base. A work about Buffalo renewal—but also about decrepitude—is called City of Dawn. It features an iconic symbol and example of the city’s renaissance in terms of valuing and conserving the treasures of its past, the Darwin Martin House. Which appears rather as background, however, behind a foreground Mayan pyramid staircase and assortment of more local ancient artifacts—an old street lamp, an old Jewett Parkway street sign, an abandoned wreck of an old Buick—half overgrown with weeds and vines, much as the Mayan pyramids and other remains had been overwhelmed and hidden by jungle growth prior to their discovery/rediscovery at the beginning of the nineteenth century. So is the message about renewal or decay? About human cultural aspiration or the futility of the whole human project? Mayan civilization was rediscovered but not reborn. The Native American references are mainly second-hand or third-hand, by way of images of Buffalo City Hall with its American Indian inspiration art deco. 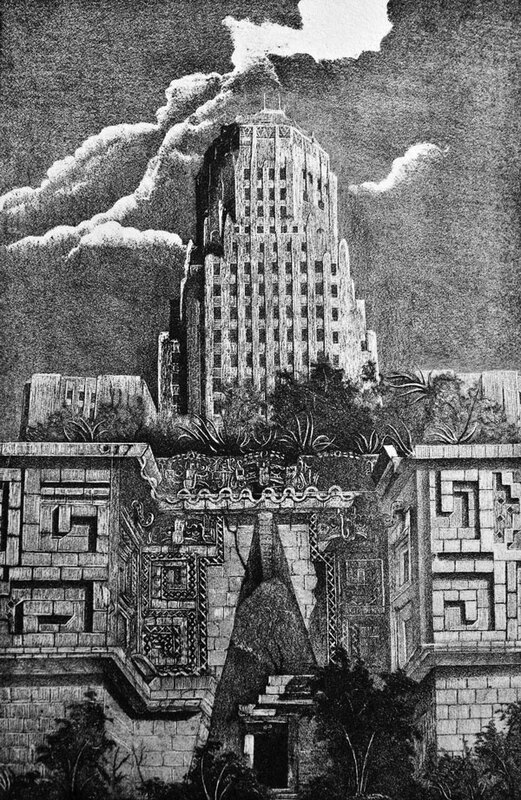 In several of the works, City Hall looms hazily above and behind a Mayan staircase pyramid and/or altar. One work specifically about ruins includes a large section of broken obelisk. An ancient Egyptian reference, it seems at first glance, which would be appropriate enough in the context, until you come to notice this is not an Egyptian obelisk—not a monolith—but constructed of uniform fitted stone blocks—the Niagara Square obelisk. In the wake of whatever cataclysm, it’s a wonder City Hall is still standing upright. In addition to the growth and decay main thematic of these works, the mix of references broadly across ages and continents and cultures raises more time-limited satiric possibilities, which are touched on more than featured. A work called At the Feet of a God shows a towering mountain form that transforms above into a typical corporate office complex, and below, at the base of the mountain, into two huge stone feet, like the feet of a statue of a god. Another piece, called Sprawl, consists of a sculptural city model—like a model railroad town, but urban—on what might be a Mayan human sacrifice altar. In a statement on his website, Hawkins notes how his artworks are essentially about metal and stone, the foundational materials of civilization, and that they will outlast us. Interesting to note in this regard that the majority of the works on show are lithographs—drawings on stone—or drawings on aluminum metal. A few are ink or crayon on board, and one is a woodcut. The Nichols School exhibit continues through ­­­­­­­­­­­­­January 16. 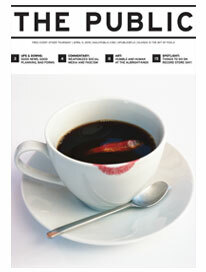 Pick up this week’s issue for a gorgeous centerfold of “City of Dawn” by Evan Hawkins.